Forget those cottony fake spider webs with the cheap plastic spiders and take your Halloween decorating to the next level when you cover your home inside and out in spooky cobwebs using this cool new Webcaster Gun. This handy decorating tool creates and blows highly realistic cobwebs with ease to add the final finishing touch to any professional-looking haunted house. Like a glue gun, just slide in one of the webbing sticks (different colors available), let it warm up, connect an air compressor to the base (shop vac model available too), and squeeze the trigger to unleash the spider webs. Only Spider-Man or an entire legion of spiders could do the job faster. Check out this video to see it in action. Cool huh? 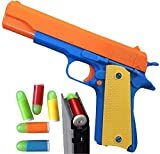 Colt 1911 Toy Gun with Soft Bullets and Ejecting Magazine. Size: 9" x 14" x 3"